Despite copius amounts of cider, or 'cidre' if you want to fit in (i.e. be served) in Brittany, Bearded stays sober (almost) enough to remember the weekend. As France’s largest festival, Vieilles Charrues is not your normal Bearded Magazine territory. But amongst acts like Mika, Muse and Jamiroquai, the Old Plough (as it translates) is also an arena for a hefty dose of independent French music that we're on a mission to investigate. Decorated like a Wild West farmyard, the 19th edition of the festival attracted over 200,000 revellers throughout the four-day celebration and inspired a lot of relevant and irrevelant costumes - we spotted: cowboys, cowgirls, pigs, horses, bees, Spongebob, Smurfs and a cactus. Check in tomorrow for the second part of our in-depth review. It’s 6:30am at the Plymouth ferry terminal, a damned early start to the four-day fest of music, sights and over-eating ahead of us, but with fond childhood memories of duty-free Toblerone and ferry discos my excitement levels are pretty high. In other words, I’ve already thrown a few rock horn hands up (an escalating trend for the rest of the weekend). But Channel waters are temperamental beasts and it soon becomes clear that this is going to be a bit of a stomach-churning ride that sends most of our party running to the cabins to assume a horizontal position. A few of us, not ones to be beaten that easily, decide that arcade games are probably a better way to keep that full English down but after watching the boys wield massive Rambo guns at an onslaught of on-screen army brutes even I’m inclined to lie down. Solid ground and sunshine awaits us landlubbers on the shores of Brittany and so we make our way to Carhaix to check out the festival stomping grounds for the next few days. It’s a Thursday evening, there’s a only a few bands on to ease us in and with the on-off again showers (the initial sunshine was just a tan-teaser), I’m a) really happy I packed my stomper boots and b) really happy that Bearded’s independent music policy means that I don’t have to stand out in the rain watching Muse. When it all culminates in some pretty spectacular precipitation, I’m only slightly disappointed that I don’t stay to watch Mr Oizo, instead opting out of the inevitable mud bath. But am I the only ignorante who thought he was a one-hit wonder? Up until this festival, I’d had no idea that there was more to his back catalogue than a yellow puppet head nodding to ‘Flat Beat’. Fool. Highlight of the day: Oldie but goldie Jacques Dutronc trying his luck with every female audience member in the middle of ‘J’aime les Filles’. Turns out yesterday was just a rite of passage for the rest of the weekend because apart from a few fleeting downpours we’re steadily working our way up the thermometer now. A lot of woodchip has appeared overnight but I’m still glad I packed my boots. It seems France cherishes a good lie-in because nothing is kicking off until 4pm. So sensible. And also a great chance for us to take a trip to a little fishing town called Camaret to stuff our faces with langoustine, steak and a Breton speciality that equates to meringue floating in custard. Despite knowledgeable French-types dressing it up with words like ‘fluffy’ and ‘pool’ and ‘delicious’, I’m still convinced that it’s going to be absolutely rank. But of course, I’m left eating my words…and pudding. Our bellies slow us down but we arrive just in time for a great set from French electro-violin-knob-twiddler Chapelier Fou. He’s playing at the Beach Box, essentially a tiny caravan structure in front of a small patch of sand, but it’s just perfect for his contemporary classical electronica. Speaking to him afterwards, he said it was the worst gig he’s ever played – hot and blinding sun is apparently not great when you’re trying to see lights on knob board (official technical term) – but really what does he know? 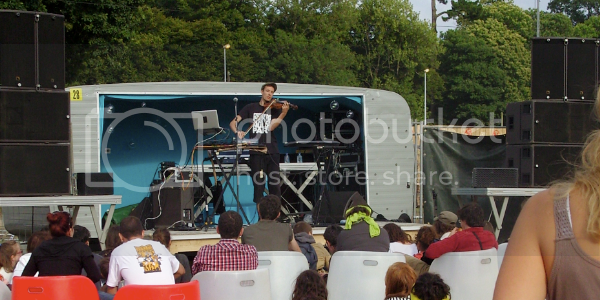 After that we’re in the Cabaret Breton tent that true to its name is a stage to promote music from within Brittany. It is also a rare bit of shade because either Brittany never really gets its hopes up weather-wise or French festival goers really like a side serving of heatstroke with their jugs of cider. We’re just in time for Ootiskulf, a local lady with really long hair who’s a bit of a rock chick but not. Actually she reminds me of my sister in an odd way because I can imagine her getting quite excited about The Rocky Horror Picture Show and being a bit of a Meatloaf fan when she was younger. Perhaps I’m not really paying attention properly. I am paying attention for Izphenn 12 though because they’re well good. A music school for 20-30 year olds to learn traditional Breton instruments and perform jazzed-up versions of local folk tunes, they’re really mesmerising. Or at least they would be if some French lad wouldn’t keep leaning over and asking me if I like it – we’d had that awkward ‘Je ne comprend pas, je suis Anglais’ moment a few minutes ago and now he can’t believe that an English person would be so up for Breton-style jams. Eventually he gets bored of me so I can go back to being ‘un petit peu’ hypnotised by this 12-piece. They male musicians all have matching fauxhawks, except for the don dada of a bass player - turns out he’s the ‘best bass player in Brittany’ who’s stepped in as a last minute replacement. Proper bo. The boys I’m with decide we need to go backstage and hang out, especially because they’d found out earlier that the mandolin player is half-English. They have both had a lot more to drink than me and I’m the only one with zero French skills, so I just stand and nod whilst they get all enthusiastic about Breton music with the mandolin man, who in returns just wants to chat about bluegrass. Full of wine and bravado, they challenge some of the people backstage to a game of table football, get floored, chat up don dada bass player, check out hot singer – I’m quite relieved when my man groupies finally make the dignified decision to get out of the ‘loge’ so we can head off to bed. Highlight of the day: Eating my second three-course meal of the day (scallops to be exact) in the restaurant area whilst comfortably watching Parisian badass rappers Supreme NTM on a big screen. Hooray again for Bearded’s indie policy – they’re on Epic, I can sit back, sip wine and chuckle.